The PR industry is making progress in tackling mental illness among its practitioners, but a new survey by PRWeek and the PRCA has found significant room for improvement. The PR industry is making progress in tackling mental ill health, with more employers taking it seriously and more employees seeking help. However, there is still much work to be done, with continued concerns about the stress and anxiety affecting many PR professionals; concerns some say are not being adequately addressed by employers, who too often fail to match positive words with meaningful action. That’s according to an extensive new survey on mental health in PR, carried out by the PRCA and PRWeek. This attracted twice as many respondents as a similar survey in Spring 2017 – 546 – suggesting the issue continues to grow in prominence. Of those respondents, 42 per cent work in-house and 40 per cent are agency-side employees. The remainder are agency owners, CEOs or board members; we will refer to them as ‘employers’ or ‘bosses’ in this article. The survey was carried out via an anonymous online questionnaire in October and November 2018. Read the main findings below. Asked whether they had ever suffered from or been diagnosed with mental ill health, 60 per cent of respondents said they had. This proportion is almost unchanged from 2017 (59 per cent). Comments from respondents can make for difficult reading. The questionnaire did not define mental ill-health symptoms – clearly, these can vary and take many forms – but stress, anxiety and depression appeared regularly in responses. Hypertension, panic attacks, anorexia, body dysmorphia, seasonal affective disorder, obsessive compulsive disorder, and self-harm were also mentioned. Several individuals made a direct connection between their mental health and working environment. One says: "[I] ended up with anxiety and mild-to-moderate depression, triggered by the negative in-house environment, bullying manager, continuous restructures and the arrival of being perimenopausal." Another states: "I had a breakdown three years ago after the situation was poorly managed by my employer." A disturbing statistic is that almost half (49 per cent) of respondents feel under more stress now than 12 months ago. That proportion is unchanged from the 2017 survey. Increased demand on employees is commonly cited as a cause. "There have been redundancies but no reduction in workload," says one respondent. "Overtime is not sanctioned so [I] have to leave work unfinished or work for free – usually the latter to maintain standards. Further restructuring is being planned. Directors are demanding but not willing to accept planning and evaluation take time. Very demoralising." 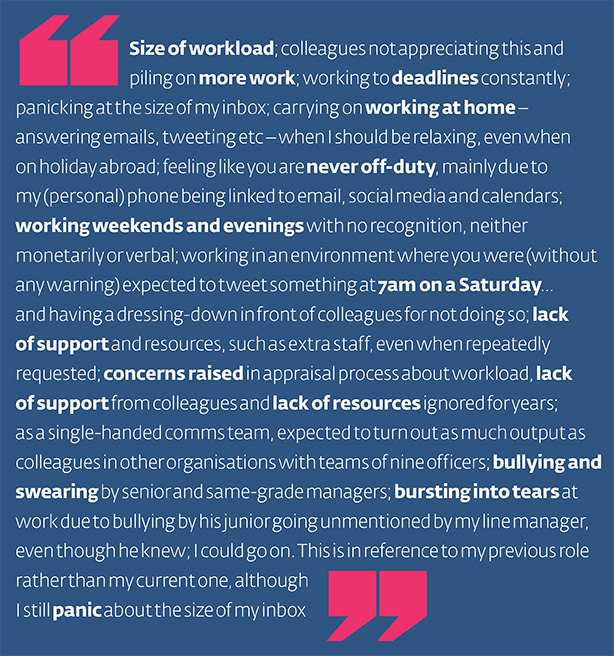 The workload problem is reflected in a recent study by Ginger Research that found 27 per cent of PR professionals work unpaid overtime on a daily basis – more than double the level (12 per cent) among average British workers. Several respondents to our survey said stressful environments had caused them to resign. One explains: "I removed myself from a toxic environment with no clear goals and bullying culture. My current environment is much more supportive; however, the nature of the challenge has changed with very tight budgets [and] difficulty recruiting due to the inability to compete on pay while expectations remain high. And it’s hard to leave behind the concerns generated in the previous environment." How comfortable did respondents feel talking about their mental health with line managers? Opinions were divided, but there has been progress, with 53 per cent saying they felt very or fairly comfortable doing so, up from 43 per cent in 2017. Forty-four per cent said they had spoken to a line manager about their mental health (2017: 38 per cent). Of those that had not, some pointed to a culture of not discussing such issues. "On a day-to-day level, mental health just isn’t talked about in the office," says one respondent. "[I’m] very unlikely to feel comfortable talking to a line manager about mental illness, or lesser but still serious degrees of mental ill-health such as high stress levels." Others go further, highlighting a hostile attitude, sometimes fuelled by a lack of understand- ing. Take this practitioner’s experience: "My line managers at my PR agency were not supportive at first, so much so that I was actually given a verbal warning as my performance had slipped so much. "It was only months later, after my mum basically dragged me to the doctors, that I got a diagnosis. Once I used the word ‘depression’ they took it a lot more seriously. But when I was showing symptoms of depression, they treated it like an HR issue. It was one of the most challenging and soul-destroying times of my life and I was only young, in my early 20s. Others focus on their own reluctance to discuss their mental health, which points to another challenge. "They’re very open people but I’m personally not speaking about it," says one individual. "I’m quite secretive." The survey suggests PRs are more willing to talk to a colleague or peer about their problems; 62 per cent would feel comfortable doing so. Again, this represents a small but noticeable increase on 2017, when 54 per cent replied in the affirmative. One practitioner in this survey said: "Initially I could not speak to [a colleague or peer] and avoided people, but after counselling I was able to and found them supportive." It is clear that barriers persist. One respondent believes "certain colleagues may use the information as competitive leverage". Another says it’s "impossible to keep stuff private" in a small team, and a third had concerns that mental health "is not necessarily an area of someone else’s expertise". One person says simply: "I’d be concerned it would undermine my authority." Employers overwhelmingly say they encourage staff to talk about their mental health with line managers; 77 per cent of employer respondents did so in our survey. That is down from 89 per cent in 2017, however. And even here, there is evidence of some resistance from the C-suite. One respondent, a board member and director, makes the point that he or she pro- motes such openness despite the fact that their CEO and chief finance officer has "expressed con- cern about my encouraging this". Nevertheless, 86 per cent of employers said they have had an employee talk to them about their mental health (2017: 78 per cent). But are line managers adequately trained to deal with such conversations? Of the respondents with line-manager responsibilities, half felt equipped to assist employees with their mental health. That’s up from 36 per cent in 2017. Despite signs of progress, the results suggest a divide in training provisions across the industry. One respondent says: "I had the opportunity with a previous employer to attend courses on personal resilience and managing stress in my team, which provided valuable insights." A lack of training has clearly caused concern for some. "I’m a first-time line manager to a part-time intern, and I don’t know how far I’m officially able to go in being supportive," a respondent explains. "The intern recently called in sick citing mental- health reasons. I sent them a positive response telling them not to worry about it, but I still don’t know where the organisation’s official stance lies. For example, does the organisation allow for time off without requiring medical proof?" Workload pressures are also cited. "There is too much other stuff to manage", says one respondent. Worryingly, an- other revealed that they had been "encouraged to get rid of employees with mental- health issues in the past". The survey points to an in- crease in formal policies on mental health among PR employers – 29 per cent of employees, and 24 per cent of bosses, said their organisation has one in place. In 2017, 16 per cent of employees and 10 per cent of employers said that this was the case. However, the new survey points to widespread ignorance on the matter among employees, 44 per cent of whom were unaware of whether their organisation has a formal policy – pointing to a significant internal communications challenge. One states: "We don’t have a formal policy, but we do have a Mental Health First Aider, and regularly share information from our EAP [employee assistance programme] provider about health and wellbeing." Some responses were scathing. One says their employer does have a policy but the bosses "just ignore it and have no idea how to deal with mental health... They talk about it a lot but can’t handle dealing with it." Another adds: "We have many tick-in-the-box exercises – it is about actually caring for your staff and my management does not." Several employers said their organisations are too small to have a formal policy, and some said they plan to implement one. Others, however, point to successes: "We have which encourages discussion and empathy and support for each other. Our mental-health support is a daily part of our agency life." Of the employers surveyed, 16 per cent have signed up to Time to Change, committing them to a plan to raise aware- ness about mental health at work. That is up from three per cent in 2017. Several employer respondents in the survey said they were not aware of the Time to Change campaign, however, suggesting that still more work needs to be done. Asked how supportive employers are of people with mental-health issues, the survey indicates that employees and bosses think differently. Not that most of the former are negative; in fact, 45 per cent of employees believed their employer was fairly supportive, and 20 per cent very supportive. However, 60 per cent of bosses believed their organisations is very supportive (fairly supportive: 30 per cent). This trend remains unchanged from 2017, when 11 per cent of employees, and 64 per cent of employers, believed their organisations were very supportive of people with mental-health problems. The improvement in staff members’ perception of their employers as supportive is encouraging, although some employee respondents painted a more mixed picture. 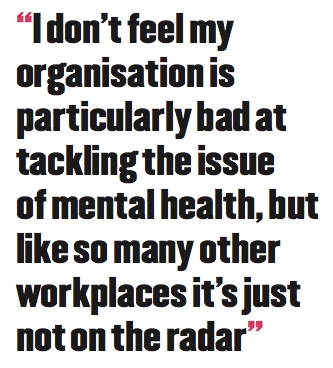 "I don’t feel my organisation is particularly bad at tackling the issue of mental health, but like so many other workplaces it’s just not on the radar," says one. "The organisation itself makes a conscious effort to offer employees a good work/life balance and be a fun place to work.However,[there is a] lack of policy/procedures in place around mental health and a failure to recognise the scale of the problem in PR." Others suggest claims of support don’t match the reality. Says one practitioner: "My company makes a big deal purporting to be supportive of people with mental-health conditions. However, if you scratch the surface and talk to people who are genuinely affected, you soon realise that this is just a front. Many people with mental-health problems are languishing with no support and unable to raise these issues for fear of negative repercussions from their line managers." Employers, meanwhile, are more likely to be upbeat. "Feedback from employees who live with mental ill health has been very positive," says one. Another states: "We have been dealing with a member of staff who suffers from depression, we have changed his job, got him some training, given him time to visit a counsellor." One respondent highlights a particular challenge associated with employer flexibility. "I have had four members of my staff suffer from mental-health problems. I have given them time off, additional work support, reduced hours. However, two have now left and as a small agency this issue has hindered us as I... now have a depleted team as a result." There are signs of positive change: 38 per cent of employees and 63 per cent of employers believed that provision for mental-health support at their organisation has improved in the past two years. One employer writes: "As my team has grown we’ve instilled a culture which supports, accepts and recognises mental health as a significant factor of workplace wellbeing." Employees and bosses alike felt their organisation is ahead of the industry as a whole, the survey indicates. Asked how accepting they feel the sector is of people suffering mental ill-health, 26 per cent of employee respondents believed it is fairly accepting; just three per cent that it is very accepting. The proportions may be small, but they have grown since 2017 (from 19 and two per cent respectively). One new respondent says the sector has "made progress due to high-profile media campaigns", but warned: "There is still a longstanding behavioural change that needs to take place." This comment is typical of some: "When I was freelancing, I went for an associate role for a piece of work at a small agency. I was open about my anxiety, which I had at the time. I didn’t get the role as they said they needed someone more ‘robust’, even though I knew I could have done it." Again, a theme emerges of ambitions not being fulfilled. "The industry is [accepting]," says one practitioner. "But senior leaders in organisations are not professional communicators and expectations are often not compatible with industry views and priorities." Employers were more positive, but still significantly less upbeat about the industry than their own organisation. Among bosses, 46 per cent viewed the industry as fairly accepting of people suffering from mental ill-health and seven per cent as very accepting. Comparisons with the 2017 survey suggest progress has been made. In that research, 31 per cent of employers viewed the sector as fairly accepting, and three per cent as very accepting. Yet few would deny the need for further cultural change on this issue as long as old attitudes and practices persist. As one respondent puts it: "Failure is not an option in PR. There’s a mentality of ‘no room for the weak’. This has to stop." "It is time that the industry takes the issue of mental health and employee wellbeing seriously. We know that the fast- paced nature of the PR and communications industry is taking a toll on our employees. This survey highlights the issue, and we can longer ignore it. I am encouraged by the progress we have made as an industry to de-stigmatise mental health issues and make employee wellbeing a priority in the workplace. It is also encouraging to see that employers and employees alike are more willing to talk about mental health. There are certainly areas where we need to improve. First, we must equip all line managers with the tools to manage the mental health of their employees. Second, we must also look at how we can make the work environment less stressful and make flexible working a priority. Lastly, we must be willing to talk about mental health and de-stigmatise it further. The PRCA will continue to raise awareness about mental health and we will continue to provide the industry with resources to ensure that workplaces are more inclusive of people with mental ill-health. 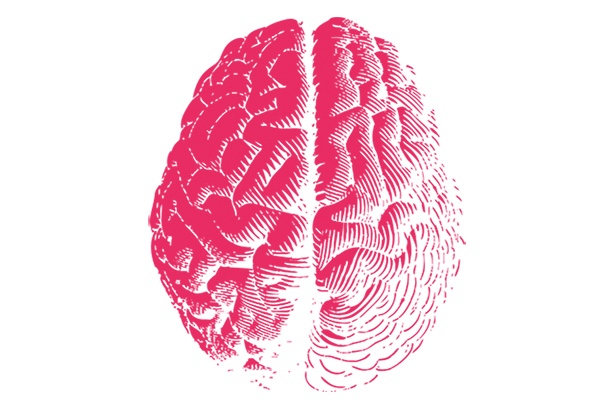 This is why we’re constantly updating the PRCA Mental Health Toolkit, and we will work with industry leaders and organisations to ensure that we’re supporting PR and communications practitioners."